Prize recognizes Philips’ innovative approach to engaging its suppliers in structural improvement of their sustainability, resulting in increased transparency of Philips’ supply chain impact. 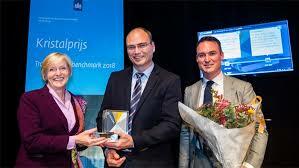 Royal Philips (NYSE: PHG, AEX: PHIA), a global leader in health technology, has been awarded the prestigious Dutch ‘Crystal Prize’, which this year focused on ‘Chain Transparency’. Organized by the Dutch Ministry of Economic Affairs in conjunction with the Netherlands Institute of Chartered Accountants (NBA), the award recognizes Philips for openness about its supply chain responsibility, transparency regarding its own impact, its cooperation with other stakeholders, and evidence of supply chain responsibility in its strategy and sustainability programs. The prize, which was awarded to Philips at a ceremony yesterday evening, follows Philips’ recent signing of the Dutch government’s latest Green Deal ‘Sustainable Healthcare for a Healthy Future’ initiative. Earlier this year, Philips was also awarded the prestigious 2018 Supplier Engagement Award by the Sustainable Purchasing Leadership Council (SPLC) for the company’s Supplier Sustainability Performance (SSP) program. Winning the Crystal Prize therefore represents further evidence of Philips’ leadership in sustainability, with firm commitments to the UN Sustainable Development Goals (SDGs) and the Paris Agreement on climate change built into the company’s long-term strategy for sustainable growth. To achieve sustainable growth, Philips has an ongoing dual-axis ‘Healthy people, sustainable planet’ program, one axis of which focuses on increasing societal benefit by enabling more healthy people, while the other axis focuses on reducing environmental impact and maintaining the resources of the planet. For more details of Philips’ ‘Healthy people, sustainable planet’ program, click here.